Today’s Final Jeopardy answer (in the category 20th Century Novels) and game statistics for the Monday, July 2, 2018 game between Suzanne Koppelman, Adam Scholze, and 3-day champion Scott McFadden. 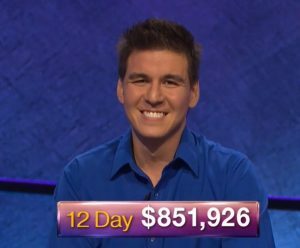 Scott McFadden returns as champion this week on Jeopardy!. See who joins him here! Today’s Final Jeopardy answer (in the category 18th Century Notables) and game statistics for the Friday, June 29, 2018 game between Nick Hurwitz, Ruth Payne, and 2-day champion Scott McFadden. Today’s Final Jeopardy answer (in the category Shakespeare) and game statistics for the Thursday, June 28, 2018 game between Kat Long, Frank Young, and 1-day champion Scott McFadden. Today’s Final Jeopardy answer (in the category Sporting Events) and game statistics for the Wednesday, June 27, 2018 game between Scott McFadden, Amy Goodchild, and 1-day champion Andrew King.